After weeks of leaks, LG’s new flagship is here. It’s nothing revolutionary—merely the most meticulously designed G-phone yet. But that could be a good thing. Where other Android handset makers—ahem, Samsung—keep pushing for pizazz, the G4 is about practicality. The G4 has a 2560 x 1440 Quad HD, 5.5-inch display, just like the excellent, though not exactly special G3 before it. The body is ever so slightly larger than the G3, measuring 148.9mm x 76.1 mm—versus 146.3mm 74.6mm. Though I didn’t have a G3 on hand for comparison, the G4 definitely seems to benefit from the same efficient, slightly curved body design that makes it feel smaller than it actually is (and places the power and volume buttons in a slightly awkward place on the back). It does weigh six grams more than the G3—but that’s effectively nothing in the real world. You won’t find anything too surprising under the hood, either: a Snapdragon 808 processor and 3GB of RAM. The performance seemed snappy and responsive when I gave it a go, particularly given how LG’s slimmed back the extraneous software—it’s mostly stock Android Lollipop on the G4. Still skinned, but lightly, with fewer apps you don’t want. The battery life is rated for 10 hours of Wi-Fi internet, 13.6 hours of video, and 19.6 hours of talk time—in case those metrics mean anything to you at all. We don’t know what this handset is going to cost yet, but expect availability the last week of May, or first week of June. Given Samsung’s recent decision to go with a unibody design on the Galaxy S6, one of the most important design choices on the G4 is that you can swap out its 3000 mAh battery. No other major Android flagship has a replaceable battery anymore, and LG execs told me they plan to make a big deal about this in marketing the phone. And with good reason. A few months ago, my colleague Sean Hollister made the excellent point that ditching replaceable battery effectively gives a phone an expiration date, seeing as batteries are amongst the first components in smartphones to fail. But for frequent travelers, extra batteries are a convenience and lifeline that Galaxy S6 owners won’t have. Oh, and there’s a microSD card slot for expandable storage as well. The downside of a removable battery is that your phone’s rear needs to be easily removable—which means it needs to be made from a flexible, durable material. In the case of the LG G4, that means plastic instead of metal. Or an optional leather back, which LG claims requires 2 months of vegetable tanning and real stitching that you can see with your naked eyes. That isn’t personally to my taste, and it’s seems a little desperate to lead with a—let’s face it—godawful leather design decision as the most pertinent feature of the new handset. It’s a curious answer to the tasteful customizability of phones like the Moto X. And one I’m tempted to dismiss as a gimmick, whereas I quite like my Moto X’s bamboo back. LG is playing up the IPS panel for its color accuracy. Where AMOLED displays tend towards saturated color that “pops,” IPS displays tend toward accuracy. When briefing the G4, LG illustrates this difference by comparing how both the Galaxy S6 and G4 screens deal with a strawberry’s deep red. We’re meant to see that it looks orange on Samsung’s phone. Although, that probably has more to do with color than with the panel itself. Here’s the same image of a strawberry rendered on iPhone 6 and G4, which both have IPS displays. The G4 is red to the iPhone’s orange. 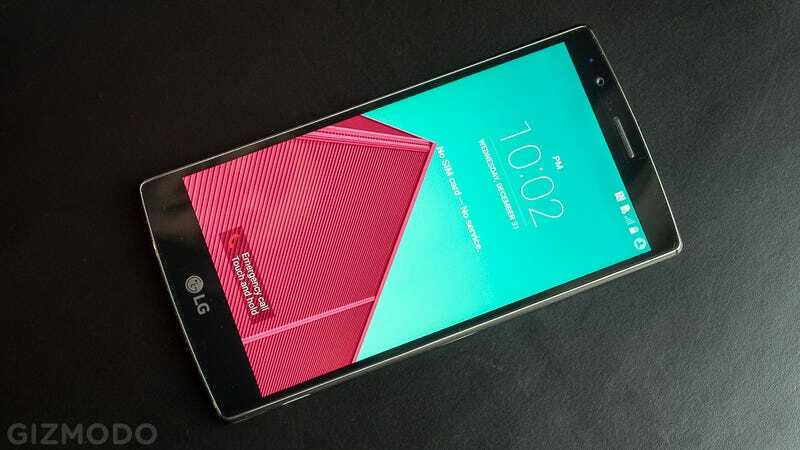 The LG G4 has an upgraded 16-megapixel camera with a super-fast f/1.8 aperture, which is wide open. The S6 has an f/1.9 aperture, while the iPhone 6 on the other end of the spectrum has an f/2.2 aperture. Aperture is important for two reasons. A wider aperture makes it easier to shoot in darker conditions without a flash. The trade-off is that it also leaves very little of the frame in focus, so you might wind up with faces out of focus from time to time. LG hopes to compensate for the latter with the flashily named “laser focus” system that’s supposedly super accurate. LG also claims this phone white balances better than any other. Finally, the G4 features a new fully manual camera mode, that allows you to independently control virtually any setting. That’s neat, but far more control than the ordinary user will need. The G4’s hardware design is super slick, especially for a phone that has a replaceable battery. It’s not quite as beautiful as the unibody competition, but it handles beautifully and seems to be nice and quick. Of course, it’s impossible to test all of LG’s claims about the camera, white balance, and the color correctness of the IPS display in a conference room, but it’s surely an impressive phone. Ultimately, the G4 looks like a welcome refinement of a tried-and-true design. Given that LG’s the last Android vendor pushing certain practical features, it might actually work this time.